Lei Lani Village Luxury Studio Condo w Access to Gulf Front Beaches & Ole River! Location, Luxury, and Amenities - this studio condo has convenient Gulf front beach access, and is perfect for a single guest, couple or small family ! Located one mile East of the Alabama Point Bridge, this Ole River second story studio condo has travertine tile, a 50" 4K / HDTV with cable / Netflix / Pandora, complimentary Wi-Fi, ColbieBlue blue tooth speaker / charging station, in room key code MESA personal security safe, luxurious Sealy hybrid gel / foam queen Murphy bed, custom cabinetry, granite tops, stainless appliances, custom recessed lighting, and more ! Extensive Lei Lani amenities include two outdoor pools, indoor beachfront heated pool, tennis court, outdoor grills and picnic areas, Ole River access, pedestrian cross light for convenient and safe crossing of Perdido Beach Boulevard, full Gulf beach access, gazebo style picnic areas at Ole River, and on the Gulf front beach, beachside bathroom and changing areas, beachfront chair and umbrella rentals, and more. Built in phases since 1983, the family friendly Lei Lani condo complex is one of the few developments on Perdido Key that is located both on the beach and Ole River. This unit is located in the 'village' portion of the complex, situated half way between the beach and Ole River. The interior has been completely upgraded, and the exterior has brand new balconies, railings, steel roof, siding, and fresh paint. The 400 square foot studio comfortably sleeps two adults on the queen Murphy bed. The luxurious bed is made by Sealy Posturepedic, with SealyCushion Foam, CoreSupport Center, reinforced gel, and SolidEdge HD System, which helps maximize the sleeping surface of the mattress while also providing a seating edge for your convenience. This may be the most comfortable bed you will ever sleep on ! There is also an Ashley Furniture Queen Sleeper Sofa, with an upgraded premium queen sleeper mattress, to informally accommodate additional guests. Ideally, this luxury studio is best for one or two adults, or a small family. As there is only 400 square feet of living space, capacity is strictly limited. Generally, we limit capacity for this studio unit to no more than three or four adults, or a small family. Please confirm prior to booking that this unit has sufficient space for your needs / guests, as space is extremely limited. If you need more space, check out our 2/2 at Phoenix on the Bay, VRBO 513462 which has plenty of room for more guests. This studio unit includes a full kitchen with all dining accessories, with complimentary starter supplies of soap, shampoo, detergent, and paper products. All towels, linens, pillows, and blankets are provided with your stay (bring your own beach towels or blankets). Views from your private covered balcony include views of Ole River, the Alabama Point bridge, Gulf State park property, and the Gulf (all of which are in the distance). Please review the 'VIEW' photo on this listing prior to booking. THIS UNIT IS LOCATED ACROSS THE STREET FROM THE BEACH (the unit is not Gulf front) on the North, or Ole River side of the complex. However, full Gulf front beach access is available, and there is a pedestrian cross light for convenient access across Perdido Beach Boulevard. This unit is convenient to both Ole River (for fishing and the beautiful Ole River front pool) and the sugar white Gulf front beaches. In addition to the multiple on-site amenities of Lei Lani, and the luxurious accommodations of the studio, Orange Beach and Perdido Key is a vacation dream for you and your family. RESTAURANTS nearby include Louisiana Lagniappe (best food), LuLu's (go at 3pm), The Gulf, Cobalt (on their deck for sunset), and the Crab Trap (has nice beach playground). ACTIVITIES nearby include biking or hiking the Gulf State Park / Orange Beach backcountry trails, a dolphin cruise, or a day at OWA, the Gulf Coast’s newest amusement park. There is reserved space beneath the covered unit to park in or to store your bikes, kayaks, and other beach accessories. UPDATED CALENDAR: If our online calendar shows the unit as available, then it is. We update the calendar within minutes of a reservation. NO KEY HASSLE - NO WAITING: No need to stand in line for check in or check out ! Entry to the condo is easy - simply key in the four digit code we supply you for the electronic keypad at the door. INQUIRIES / QUOTES / AVAILABILITY: To check availability, click on 'view full calendar.' To get an instant quote using our reservation calculator, simply click 'just need a quote 'click here'' button, enter your dates of stay, and the reservation calculator will give you an exact quote for your intended stay. RESERVATIONS: Reservations for the condo are easy ! Our preferred method of booking is for you to use the 'BOOK IT' button on the top right hand side of our site, and follow the online instructions to book the unit through the online VRBO credit card payment system. This preferred payment option is available 24/7 as it is an automated process to book the reservation. Once paid in full, a confirmation email is sent to you through VRBO. Later, and prior to your stay, we email you the directions to the unit, what to pack, parking instructions, the unique keyless code for entry to the unit, and other important information regarding your stay. REQUIRED ID / AGE RESTRICTION: Renters generally must be 25 or older. Violation of this rule results in forfeiture of stay and deposit. ID and minimum age verification is reconfirmed upon checkin. NO SMOKING: This is a strictly non-smoking unit / complex. There will be a $1500 fine, forfeiture of stay, forfeiture of damage deposit, and required reimbursement for all costs of deodorization (which could be thousands of dollars) if smoking or vaping occurs in the unit. This rule is closely monitored and strictly enforced. Smokers and or vapers are strictly prohibited from renting this unit. NO BOATS, NO PETS, NO PARTIES: Boat slips and trailer spaces are reserved for owners only. Pets are not permitted. No more than four persons are permitted inside the unit at any given time - no parties. REFUNDABLE SECURITY DEPOSIT: A $200 fully refundable security deposit is required, in addition to the amount owed for the stay. The refundable deposit varies depending upon the season (Spring Break) or event (Hangout). Assuming checkout compliance, the security deposit is credited back to your credit card on the seventh day following your checkout, with an emailed receipt thanking you for your stay. This is an automated credit back procedure taken care of by VRBO unless the owner makes a claim against the security deposit. PARKING: A parking pass must be purchased upon your arrival at the condo office located in the main Lei Lani tower on the beach (adjacent to the indoor heated pool). Each parking pass is $20, and is good for your entire stay. If you arrive late or after hours, simply need a note on your dash indicating that you will be securing one the following morning. STAIRS: There is no elevator access to this second story condo. It’s two short flights up from the reserved parking space beneath the unit. This unit is owned and managed by James Dorgan, an attorney who lives and practices law in Fairhope, Alabama. James is married to Lauren Dorgan, and they have two children. James also owns vacation rentals at Phoenix on the Bay in Orange Beach, and Splash in Panama City Beach, Florida. Location, Luxury, Amenities, and finally, PRICE ! 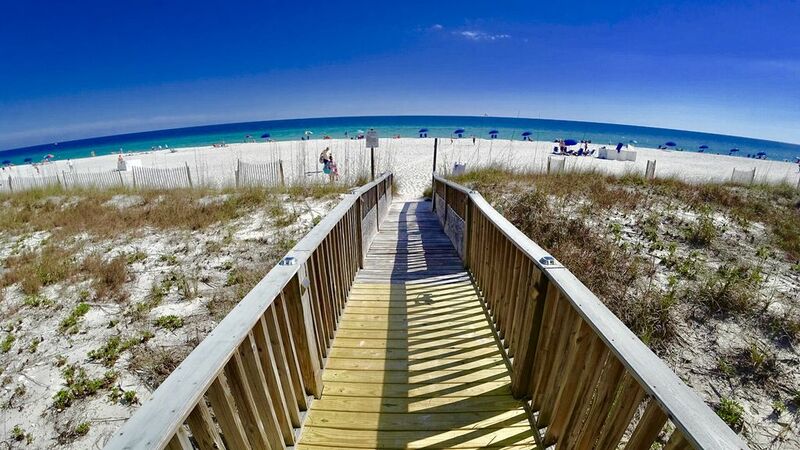 Lei Lani Village is ideally situated along the narrow strip of beach between the Alabama Point bridge and the Alabama Florida state line, which arguably boasts the most beautiful 2 mile stretch of sugar white sands and aqua marine waters in the State of Alabama. The condo is completely updated, with travertine tile, flatscreen TV, granite and stainless, and modern bathroom. The complex has multiple pools, tennis, and includes access to both the Gulf and Ole River, and the walk to the beach from the unit, even though the unit is across the street from the beach, is very short. Finally, the price for the studio cannot be better. You are able to have a small, but luxurious room in the heart of Orange Beach, with fantastic interior upgrades, for an extremely competitive price. Crabbing, fishing and catching minnows for the kids at Ole River. Boat watching from bar stools overlooking Ole River. Safe and easy crossing of boulevard to gulf front beaches, with beachside restrooms, indoor and outdoor pools, raised walkway across dunes, umbrella and chair rentals, all without paying Gulf front prices. Walk in glass shower, adult height african granite countertops. Obstructed view - please review VIEW photo for picture of the view of the beaches in the distance from the balcony. Unit is located across the street from the beach. Obstructed view - please review VIEW photo for picture of the view of the Gulf of Mexico in the distance from the balcony. Unit is located across the street from the beach. Obstructed views of river, beaches and Gulf in the distance - please review VIEW photo for picture of the view of the beaches, Gulf, river in the distance from the balcony. Unit is located across the street from the beach. Please clean linen screen before each use for maximum efficiency. Complimentary in room Wi-Fi provided by condo association. Bar style table with two bar style stools. Recently renovated tennis court; fish cleaning station at Ole River fishing area; Gulf side beach chair and umbrella rentals through Lance's Beach Service; pedestrian cross light permitting easy access to Gulf side Lei Lani tower and Gulf front beaches; Elevated boardwalk across beach dunes down to beach; On site Lei Lani complex manager (John). Condo was clean , and nice! Unit needs new shower head and dryer didnt dry clothes well... other then that, we loved it!! We thoroughly enjoyed our stay at Lei Lani unit 209. The condo is everything we expected from the description. Clean, stylish, current. Comfortable bed. Perfect for our small family of three. The boat slips and pool area were exactly as pictured. Beach was beautiful. The indoor pool located in the main hub across the street could probably use a facelift but still functional. The owners are amazing. Always friendly and quick to respond to any inquiries start to finish. I would definitely recommend and/or stay again! This property was a great location - just steps away from the beach, and close to restaurants and shops. Clean, quiet, great experience! This is a cute little condo but for two adults and two teenagers it was very tight. Everything worked fine and it is conveniently located. As this is a studio with one full bath, we do not recommend that more than two adults stay in the unit. We do have a sleeper sofa for informal accommodation of a child or small children. Space is indeed limited and so we encourage guests to limit their total number of guests staying in the unit accordingly. Clean, Well maintained, close to beach, easy access to unit 209. Outdoor pool well maintained. Indoor pool needs repair and is not to welcoming. Four our small family of three, this unit was perfect ! The affordability let us enjoy a wonderful family vacation. Can not wait to return next summer! The only improvement would be if the association would install an elevator system for luggage. Sugar white sand beaches, deep sea fishing charters, dolphin viewing charters, great area seafood restaurants including LuLu's, The Gulf, and Louisiana Lagniappe. Other area attractions include the zip line at Gulf State Park, and the Hugh Branyon Wilderness Trail. This is Alabama's coastal playground ! ! Rates are subject to change until reservation is confirmed. Snowbird rates are also available - simply inquire.